Nantes-Rezé hosted their first LFB match at the Arthur Dugast Gymnasium. The hall was only half filled and the game will be quickly forgotten by those who attended. Mondeville took a long time to get into the match. They only managed to stay in touch because of the tenacity of their captain Paoline Salagnac. Simon Guillou explained after the match that his side played well for 30 minutes. He added that basketball though was played over 40 minutes. Salagnac top scored in this match with 21 points for Mondeville. She also dished out 3 assists. No other player for her side finished in double digits. Julia Andreyeva was the leading scorer for the match with 22 points for the hosts. It included 3-of-4 from the land of many. With her failing to score in the last period Nantes-Rezé's chances of victory disappeared. She was the only player to reach double digits in her team. Michele Van Gorp is still finding her way back but she finished the game with 13 rebounds. Mondeville went 0-for-15 from beyond the arc before hitting 3 in the final period. They also restricted their hosts to 2 points in the final period. You can listen to some after-match comments from Simon Guillou, Olivier Hirsch, Paoline Salagnac, Clarisse Costaz, Nyree Roberts and Marie Vicente Santa Cruz after the full LFB match report. Both sides started slowly with a number of turnovers as the last passes failed to reach the target. After nearly two minutes of hesitation Nyree Roberts opened the scoring as she split a pair of free-throws. Van Gorp was not having the best of times with the final passes and shots. But her perseverance in contesting rebounds eventually paid off. She won a tough offensive rebound and fed the ball out to Julia Andreyeva who hit a baseline jumper for the home side's first points of the match after 3:15 of play. Andreyeva was to score again as Nantes-Rezé started to settle into their stride. Jennifer Digbeu who was not having much luck with her distance shooting managed to get a tap in just under the boards for Mondeville. Doriane Tahane came in for Van Gorp and started to cause Mondeville problems inside as she fought for everything. Meanwhile Sandrine Ronot hit a jump shot (6-3). Paoline was the only player from Mondeville that looked sharp. She managed to block a pass from Carine Brossais and went on to score for Mondeville. Nantes did not panic. With Tahane scoring 3-of-4 from the charity stripes and Van Gorp hitting a mid-distance jumper, they edged the first period (11-7). Mondeville continued to shoot from beyond the arc in the second period. With the exception of one effort from Natasa Ivancevic the ball refused to drop. Simon Guillou, the coach from Nantes-Rezé, called a time-out after his side failed to add more points to their score after 2:30 of play in the second quarter. Kaela Chapdelaine was having problems getting past Salagnac. Eventually she was stripped by Salagnac who then went on to score. Marie Vicente Santa Cruz was called on for Chapdelaine. But on the next action she slipped while facing Salagnac and appeared to have hurt her ankle. In the meantime Salagnac scored to give Mondeville the lead (14-13). Vicente Santa Cruz had to leave the court and Chapdelaine returned to the frey. The game was finally picking up and becoming more physical. Ivancevic clattered Andreyeva as she fired off a three-pointer. Yet Andreyeva still managed to hit and added the bonus from the free-throw line (17-14). The teams were level once again as Salagnac made a couple of free-throws (19-19). Afterwards Nantes went into three-point drive as they hit back to back treys from Andreyeva and Chapdelaine. Oliver Hirsch called for an immediate time-out. 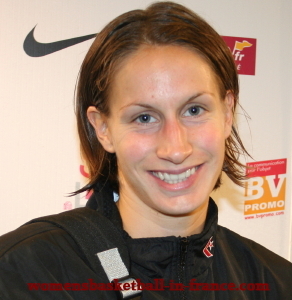 On resumption Jennifer Digbeu scored with a three-point play (2+1). But Mondeville's joy was short lived as Andreyeva hit her third trey of the quarter. The last points of the first half came from the tireless Salagnac. Nante-Rezé went into the interval leading (28-24) with 16 points coming from Andreyeva. In the meantime Mondeville went 1-for-10 from beyond the arc. Vicente Santa Cruz returned at the start of the third period with Leslie Ardon making her first appearance in the game for the hosts. Roberts was to score the first points of the second half of the match as the battle between herself and Van Gorp inside the paint became intense (both in picture). Andreyeva scored again for Nantes. But then Mondeville started to dictate the pace and scored off two interceptions from Roberts and Digbeu. The LFB match was tied once again (30-30). The two sides spent the rest of the quarter running up and down the court with Mondeville edging in front as Salagnac started to win her one on one match-ups (36-31). Mondeville left Andreyeva open for a split second. So she punished them with a baseline jumper. Then she was fouled by Ivancevic in the paint and added 2 more points to her tally from the free-throw line. However Mondeville went into the final period ahead (36-35). Roberts once again opened the scoring in a quarter for Mondeville. This was followed by the first three-pointer of the evening for Mondeville from Salagnac (42-35). Nantes were now struggling for the first time in the match. When Digbeu finally hit a three-pointer Mondeville opened the first significant lead of the game (45-35). Tahane ended the barren spell for Nantes with a jump shot in the paint as the game clock read five minutes to play. In the very next action Chapdelaine stripped the ball off Salagnac and passed the ball to Morgane Cardin, who then wasted the opportunity with a wild pass. Afterwards Nantes-Rezé fell apart and allowed the game to pass them by. Pauline Jannault who had been invisible for most of the game hit another Mondeville three-pointer from the top of the arc with 2:40 left to play (48-37). This made the game safe more or less. Mondeville controlled the closing minutes with Salagnac doing most of the offensive damage. On the other hand Nantes continued to turn the ball over for their guests to win their first match of the season (53-37). The LFB match comments from Marie Vicente Santa Cruz and Simon Guillou were conducted by Nantes 7, a local television channel. 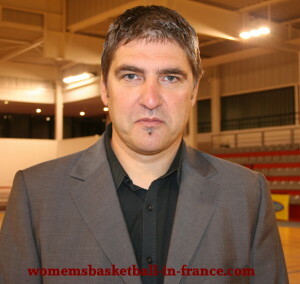 womensbasketball-in-france.com interviewed the players and the coach from Mondeville. All the interviews with the exception of Nyree Roberts are in French. 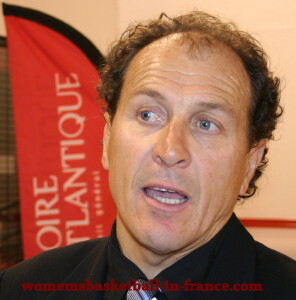 Simon Guillou's introduction to the professional world of the Ligue Féminine de Basketball was to pick up a fine of 100 Euro for not wearing a tie during the Open LFB. Wearing a tie this time, he went into detail about the way the match was lost for his team despite a good start: In basketball it was not possible to win if you had more turnovers than assists. He continued that Mondeville turned the ball over 12 times while his side accumulated 30 turnovers during the game. Marie Vicente Santa Cruz was happy with the improvement after their first game and that they held out for 30 minutes this time. However they have to reduce the errors as they were penalised immediately. Olivier Hirsch was happy that they won this LFB match and the way his team defended in the second half as they only conceded 9 points. All the same he explained that offensively there was still room for improvement as the players were not able yet to position themselves well in this game. Paoline Salagnac is happy with the way they defended in the second half of the match as they only conceded 9 points. She concluded that despite the difficult opening the way to win games was to defend well for 40 minutes and then the victories would come. Clarisse Costaz explained it was not an easy game and probably not a nice match to watch. What was important in this LFB match was to bounce back after the defeat at the Open which they did. She also said that she was happy with the way they defended and fought for this match despite the problems in offense and also to win her first match for her new club. Nyree Roberts explained that it was a tough game physically. Strong defense in the second half made things easier after a difficult first half.